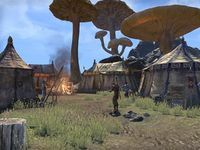 The Gladiator's Quarters is the battlegrounds quarters located south of Foundation's Labor in Vivec City. It is home to several gladiators and Battlegrounds merchants. Battle-Ready Market — A battleground merchant stall run by Alyze Metayer. Battlegrounds Housing Goods — A battlegrounds furnisher stall run by Brelda Ofemalen and Llivas Driler. Gladiator Trading Goods — A battleground supplies merchant stall run by Colotarion. This page was last modified on 19 November 2018, at 07:21.